This is one coloring book, that I made copies of to let my kids color, and my husband. 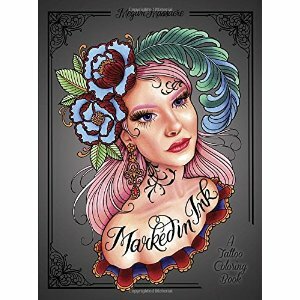 The gorgeous tattoo pictures turned to coloring,is absolutely detailed black and white. Once you color them they are like the tattoo’s come to life. I have to say this artist has so much talent it is amazing. There are a few that are my favorite, that I could see being tattooed on people. This work of art is truly inspiring. There is so much detailed to the pictures it is not something you want to rush into ,that is why I make copies in case of a mistake and it dont ruin the book as the details are so inspiring. I am truly lost for words it took me by surprised that quickly. I have to give this artist so much credit and it must have took her a lot of time to out line each drawing ito perfection to make a outstanding coloring book for adult. If she creates more I would have to say I am up for more challenges with her details. Disclaimer. I received this free in exchange for a honest non biased review.